Pioneers in the industry, we offer helical bevel gear, spiral bevel gear, straight bevel gear, hypoid gears and bevel gears from India. We are an acclaimed name engaged in offering our precious clients a superior quality range of Helical Bevel Gear. Our bevel gear is tested by our quality experts so as to assure its perfect range. 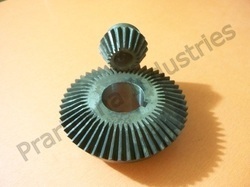 This bevel gear is available in assorted specifications as per the variegated demand of customers. 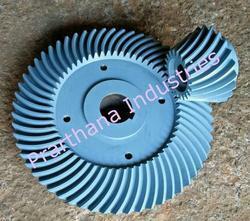 Customers can easily avail this bevel gear from us within a given time frame at affordable rates. As per Drawing / As per Sample or As per Technical Specificatiion, From 1 Module to 8 Module in Teeth Profile Capacity. 25mm to 450mm Outer Diameter Capacity, As Required on Conventional Milling Machine or on Bevel Genarator. 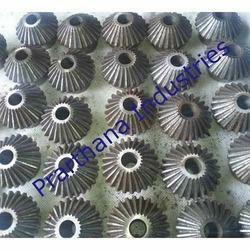 Being perfectly shaped and swift movement of our organization, we are instrumental in offering Straight Bevel Gear. These bevel gears are acknowledged among customers due to their optimum quality & easy installation. Offered bevel gears are designed utilizing finest grade material & modern techniques under the guidance of professionals. We stringently check these bevel gears on several parameters to ensure its excellence at users' end. 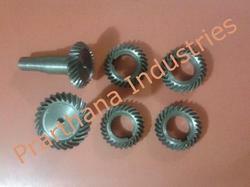 Hypoid Bevel Gears made in various material as per customer's requirement. Owing to perfection and quality oriented approach, we have carved niche in the industry by offering Bevel Gears. 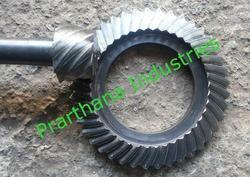 The given bevel gear is available on diverse specifications as per the need of customers. Our bevel gears is designed with the help of top quality material and leading technology as per the set norms of industry. This bevel gear is well tested on diverse parameters of quality in order to make certain its flawlessness. Looking for Bevel Gear ?